With all the lovely fresh snow we’ve had here in the mountains, we took the opportunity to get outside this weekend and build a snowman! We find that spending time outdoors helps us unlock fresh inspiration and overcome creative blocks… and science agrees. Studies have shown that being outdoors can improve memory, reduce fatigue, boost energy levels and fight depression. Just 20 minutes a day outside may be all you need to allow your brain to refresh, restore and start functioning again. So next time you’re struggling to bring your ideas to fruition, consider spending some time in the fresh air... it may be better spent than staring at a screen trying to come up with the creative solution you’re searching for. There’s no better way to get into the festive spirit than by listening to classic Christmas tunes! Plus, we find that playing upbeat music in the office boosts our creative thinking. Studies suggest that listening to happy tunes improves cognition, enhances learning and boosts memory - all of which increase our capacity to come up with original and imaginative ideas. It’s a process researchers call ‘divergent thinking’. Need a Christmas music boost to get your creative juices flowing? Head over to Spotify, where we’ve selected some of our festive favourites and created the ultimate playlist. Search ‘WhiteTriangleAgency’ to find our Spotify profile and select the playlist ‘White Triangle Christmas’. We challenge you not to feel inspired by festive cheer! Release you inner child and embrace some Christmas crafting! Last Friday night we made these festive paper snowflakes to decorate the office with. Making something by hand can be a huge creativity boost. Using your hands to craft involves getting information from multiple senses at once, which can stimulate creative thinking. Plus it’s super fun! It’s no secret that your environment can greatly influence your mood and this will have a big impact on your creativity. Bright office lights are great for keeping your energy levels up and making you hyper focused. However, creative insights often come when your brain is allowed to relax and flow freely. To prime yourself for your next big idea, try dimming the main lights and enjoy the warm glow of some festive fairy lights instead. Dig out your rolling pin and turn on the oven! Baking can have a profoundly positive effect on your mental health and wellbeing. For many it provides a therapeutic outlet that can help balance and clear the mind. Back in the day, the grandfather of our Creative director Steph Caller was a Swiss baker. 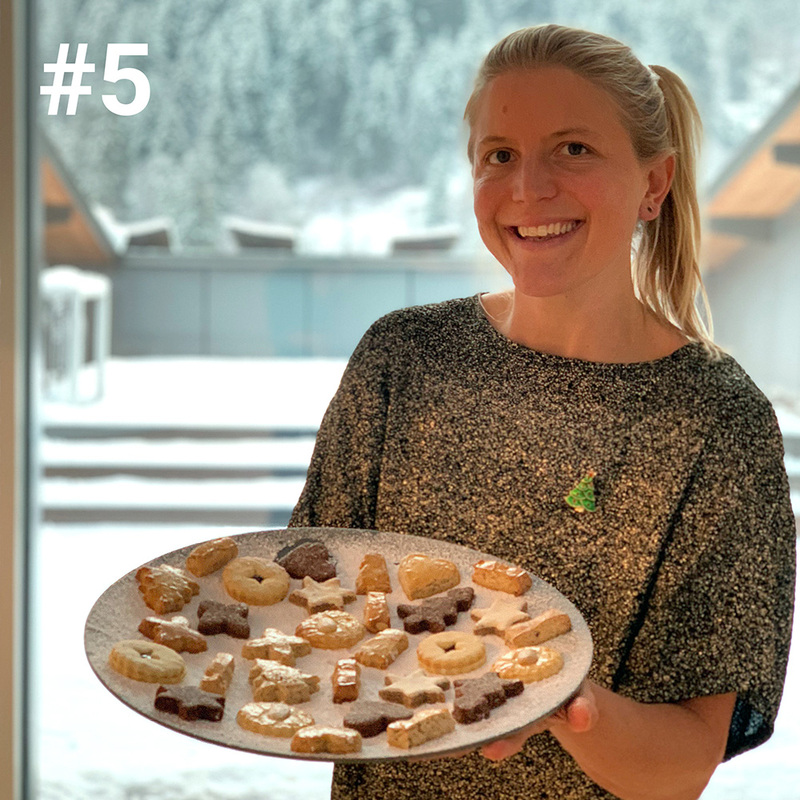 The recipes for these traditional Swiss Christmas biscuits (or ‘Guetzli’ as they are known in Switzerland) have been passed down through generations and the tasty results are currently being shared around our office! We’re not going to lie though, this beautiful batch were actually baked by Steph’s mum. Thanks Rösli! Happy socks make for happy feet! Plus, research says that ‘Crazy sock wearers are more brilliant, creative and successful’. Wearing fun socks to work not only allows you to express your personality creatively, it could help you to think more creatively too. What we wear affects the way we feel, act and think. Bright colours and exciting patterns for example, have been shown to be mood and energy boosting. A positive outlook can improve brain function and help us find more innovative creative solutions. What better reason to show your feet some festive love and don a pair of Christmas socks! However, we would draw the line at ties that sing jingle bells…! Watching festive films can stimulate the imagination and help boost creativity. Add this to curling up in front of the fire and you have the perfect recipe for feeling warm inside and out! Christmas is a time for believing and sharing festive cheer with those around us. Applying the same optimism to our creative projects can have a profound impact. Believe in your ideas; keep an open mind; listen to others; ask for help; praise good work; share your knowledge and always be kind. Follow this mantra and your creative ideas will surely flourish in 2019. Hands up who's working between Christmas and New Year? Why not spruce up your hot drink to keep you feeling festive for longer! Cinnamon can boost brain function to help channel your creative genius. Make some festive stencils and sprinkle Cacao powder onto your hot drink. Cacao has 40 times the Antioxidants of Blueberries! Healthy body = healthy mind. The key compound in turmeric (Curcumin) could boost memory and mood, helping you to come up with innovative ideas. We find sketching our ideas out on paper first really helps the creative process. It’s easy for creative concepts to become compromised when transferring your ideas straight from your mind to the computer, as even the best design programmes have their limitations. Sketching helps us develop our ideas with fewer boundaries! Keep a sketchbook next to your desk so you have somewhere to sketch out your ideas as soon as they come into your head. We enjoyed using pen and paper to develop these logo concepts for ChamoiX Coaching (a coaching and leadership development brand based here in the Alps). Keep your eyes peeled for the finished logo design case study on our Instagram feed in the New Year. It’s easy to fall into the habit of tucking into all those treats over the festive season. But making these poorer snack choices daily will cause energy level dips, which will impinge on your ability to think creatively. Start 2019 by snacking smart: Try replacing those chocolatey treats with a healthier alternative. We sought nutrition advice from High Performance Dietitian Rebecca Dent, who gave us some great ideas for nutrient rich, healthy snacks and juices. On cold, dark January evenings it can be difficult not to sink straight into the sofa after finishing work, but it’s really important to stay active during the winter months too. As well as the obvious physical health benefits, research suggests that regular exercise can improve cognition and help you to think more creatively. We have some of our best ideas after an intense work out! Plus, exercising in cold weather forces your body to work harder, releasing more endorphins and boosting your mood. Here in the mountains we are very lucky to have snow during the winter months, allowing us to participate in a whole host of winter sports right on our doorstep. If you’re local, we encourage you to make time to get active out in the snow. If you’re in the city, why not try something new this month and sign up to Class Pass or join your free local Park Run on Saturday mornings. Photo credit: Action shot of local skier @tom_grant_ at the start of the season here in Chamonix. Older PostHappy 1st Birthday White Triangle!